← Sometimes the truth is better left dead . . .
It’s one hell of a Hair Raiser! Nancy J. Cohen does it again with another terrific Hair Day mystery! Add to Goodreads List: https://www.goodreads.com/book/show/24478683-hair-raiser WHAT IT’S ABOUT: Hairstylist Marla Shore volunteers for Taste of the World, a fund-raiser sponsored by Ocean Guard. It’s a decision she soon regrets. First Chef Pierre’s rum-soaked Bananas Foster goes up in flames, making her wonder if sabotage caused the incident. Her suspicions deepen as more chefs drop off the roster and Ocean Guard’s attorney is murdered. Does the lawyer’s death relate to an estate being managed by the group? If their gala fails, this property will fall into the hands of a mysterious heir. Marla’s friend, dashingly handsome Detective Dalton Vail, believes the culprit might be one of Ocean Guard’s esteemed board members. She determines to help him untangle the clues. With a killer on the loose, Marla has a lot more to worry about than which canapés her chefs should serve. She’d better comb through the knot of suspects and catch the saboteur before he strikes again. With her witty style and flair for local color, Nancy J. Cohen has created another page turner that will leave readers eager for their next appointment with sassy salon owner Marla Shore. NOTE: Hair Raiser was originally published by Kensington Publishing Corp. This Author’s Edition has been revised and reformatted with added bonus material. 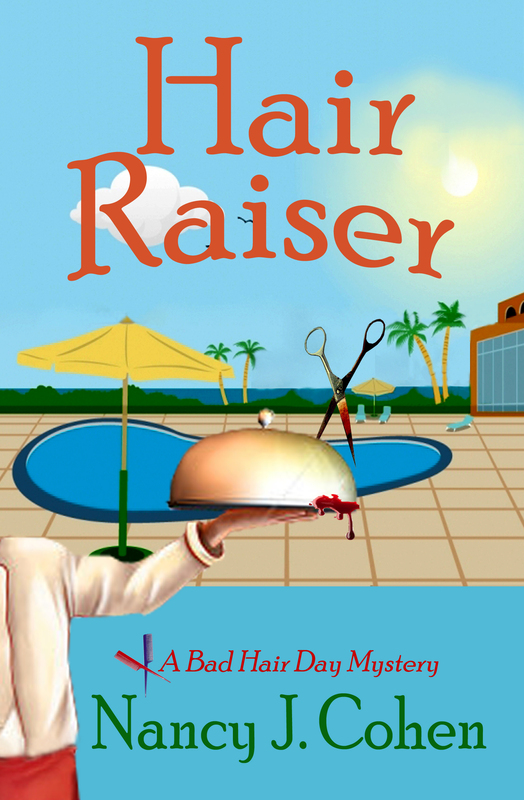 Nancy J. Cohen writes the humorous Bad Hair Day mystery series featuring hairdresser Marla Shore, who solves crimes with wit and style under the sultry Florida sun. Several of these titles have made the IMBA bestseller list, while Hanging by a Hair was a “Best of 2014” selection by Suspense Magazine. Nancy is also the author of Writing the Cozy Mystery, a valuable instructional guide for writers on how to write a winning whodunit. Her imaginative romances have proven popular with fans as well. Her titles in this genre have won the HOLT Medallion and Best Book in Romantic SciFi/Fantasy at The Romance Reviews. Nancy’s Drift Lords series, where ancient myths and magic mix in a modern day setting, are published by The Wild Rose Press. When not busy writing, she enjoys fine dining, cruising, reading, and outlet shopping.